This program runs a uniform price double auction, in which buyers and sellers submit bids and offers, which are ranked and crossed to determine a provisional trading price. The market is "called" and trades are finalized when the time expires or the experimenter presses the Stop button. At that time, all units with offers below the clearing price are sold, and all units with bids above the clearing price are purchased. Variants of this procedure are sometimes used in electronic trading of stocks and in wholesale markets for electric power, which are cleared hourly. The program permits the instructor to implement market changes "on the fly" after any round, e.g. demand or supply shifts, taxes on buyers or sellers, price ceilings or floors, and collusion among buyers or sellers. The default setup scales to yield essentially linear S and D to facilitate discussion of efficiencies, shown at the top of the graph in red. 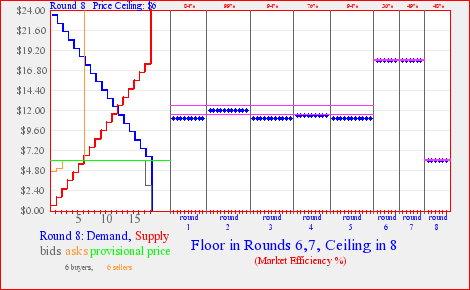 Note that random seller selection among tied ask prices at the price floor (rounds 6 and 7) caused efficiencies to drop much more than would be indicated by a standard Harberger triangle.